President Leshin holds the scissors as the ribbon is cut for the Foisie Innovation Studio and Messenger Hall (caption below). Photo caption: cutting the ribbon are, from left, Graduate Student Government president Kyle Young, Student Government Association president Sarah Boecker,State Senator Michael Moore, Massachusetts Secretary of Energy and Environmental Affairs Matthew Beaton ‘01, President Leshin, WPI Board Chairman John Mollen, State Senator Harriette Chandler, and Massachusetts Assistant Secretary of Technology, Innovation, and Entrepreneurship Damon Cox. 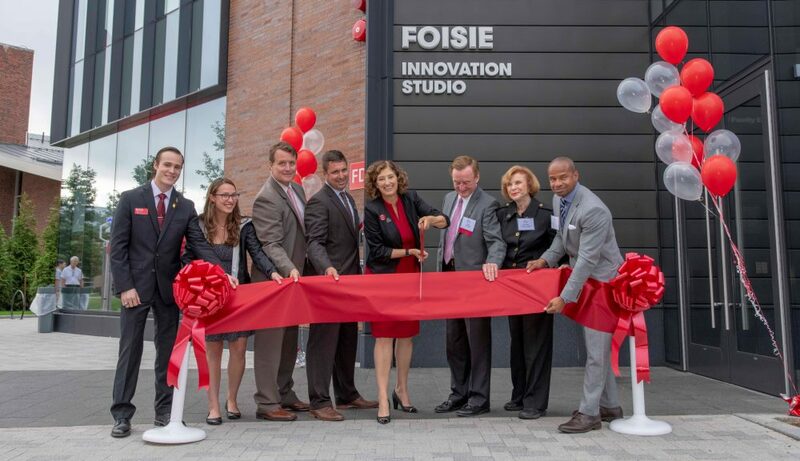 Worcester Polytechnic Institute (WPI) formally opened its Foisie Innovation Studio and Messenger Hall in a ribbon-cutting ceremony attended by alumni, donors, and state and local officials. Calling it “the front door to innovation,” President Laurie Leshin described the building as the physical embodiment of the “modern WPI Plan”—the university’s distinctive project-based education, a curriculum that blends classroom learning with hands-on, real-world experience, which was launched in 1970. The $49 million, 78,000-square-foot residential and classroom facility was funded, in part, through an alumni-led fundraising campaign that garnered more than $18 million and included a challenge grant from the George I. Alden Trust that inspired more than 1,300 donors to contribute to the campaign. The building is named in honor of the late Robert A. Foisie ’56, and for Priscilla and George Messenger Jr. ’51. Bob Foisie’s lifetime commitments provided the funding to help more than 600 students realize the dream of a WPI education. The Messengers have long been devoted to supporting students, as well; in 2001 they established the Scholarship Fund, and have made generous commitments to that fund over the years. The ribbon-cutting ceremony included remarks from Damon Cox, Assistant Secretary of Technology, Innovation and Entrepreneurship, Massachusetts Executive Office of Housing and Economic Development, and Matthew Beaton, Secretary of the Massachusetts Executive Office of Energy and Environmental Affairs. The first and second floors of the new building include a teaching laboratory currently configured as a robotics lab, a makerspace, and high-tech classrooms for the Great Problems Seminar, courses that introduce first-year students to WPI team-based projects. The Center for Innovation and Entrepreneurship, led by newly recruited Executive Director Donna Levin, supports the “practice” side of WPI’s motto by helping students find paths to commercialization for their projects. Super glue, Teflon, microwave ovens—accidental discoveries all. With the invitation to create, model, and test new ideas and state-of-the-art equipment (like rapid prototype 3-D printers), we can only imagine what’s going to come out of the makerspace. Inspiring unstructured creation, this is where the smallest connection can start the biggest change. What makes active learning classrooms different? Lots! This classroom uses space and furnishings with intention—to help students gather in groups or so faculty members may teach while moving around the room. The focus for this space: WPI’s Great Problems Seminar. All robots, all the time. This teaching lab might look like a futuristic playhouse, but the work done here will change the way surgeries are performed, caretaking happens, manufacturing is produced, and music is played. It’s all about the robots—and it’s a blast. At the two-story video feature wall, take in the compelling and inspirational visual representations of the WPI Plan ideals. See the places around the world that we send our students, the stories and activities of students and alumni, and the complexities of our science and technology scholarship. Additional space for active learning welcomes larger groups and more opportunity for students to engage with the curriculum and each other. A global education is a WPI hallmark, and the Global Lab brings together project-based learning, digital storytelling, and engagement with our partners around the world. Here we explore how audio/visual tools and emergent media technologies can deepen collaboration, expand the impacts of global partnerships, and provide new opportunities for reflecting, learning, and sharing. The Messenger Residence Hall includes 140 beds in double and single rooms, with tech suites and common lounges on each floor, and sweeping views of campus and the city. Auntie Anne’s Pretzels and Planet Smoothie, on the building’s first floor, offer smoothies, hot pretzels, and other snack foods. Designed by Boston-based architectural firm Gensler, the Foisie Innovation Studio and Messenger Hall was built by Shawmut Design and Construction, of West Springfield, Mass. The project was managed by KVA Building Industry Consultants of Boston. The ambitious project was completed in just two years, from groundbreaking in May 2016 to move-in day in August 2018. It incorporates the WPI limestone seal and scrollwork, salvaged from the façade of Alumni Gymnasium, along with a number of grotesques, into the new exterior wall of Harrington Auditorium, which had been connected to the old gym. The grotesques are mounted amid an iron lattice work that is expected to fill over time with ivy and invoke the ongoing commitment of WPI’s alumni to the evolving campus.